Inspired by the high season on the French Riviera, Fabergé’s new fine jewellery and timepiece collection is a sparkling ode to the beautiful Côte d’Azur providing some of the best sea-inspired jewels around. Colourful, playful and completely charming, the Summer in Provence collection uses texture and layering to recreate the landscapes, light and floral patterns of southern France via necklaces, earrings, rings and timepieces. Carefully chosen precious stones, including pearls, diamonds, sapphires, tourmalines and emeralds, combine with vivid polished enamel to evoke the colours of azure skies, crystalline seas and abundant flowers. Each of the fine jewellery pieces takes the loose form of a ribbon, said to be partly inspired by the brand’s heritage in Russian folklore and partly inspired by the long, flowing summer dresses often worn on the coasts and yachts of the French Riviera. In a similar nod to Fabergé’s history, a necklace from the collection also features a detachable egg embellished with flower motifs. The watch portion of the collection has been designed to complement the fine jewellery and each, in itself, is a fine jewellery timepiece. 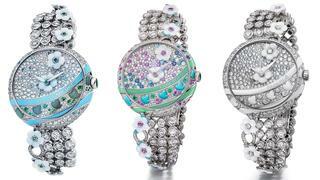 Designed to resemble a garland of flowers blowing gently in the sea breeze, each watch is studded with precious gems across the case and incorporates hard-stone floral micro-sculptures to mark these timepieces out as anything but ordinary. Available in diamond, emerald and sapphire versions, each design is strictly limited to five pieces and features over 1,000 individual diamonds, pearls, emeralds and tourmalines across an 18 carat white gold case and bracelet. However, with a 50-hour power reserve and sapphire crystal case back exposing a 193-component custom automatic movement, these timepieces are as technically impressive as they are beautiful. First unveiled at Baselworld 2015, the Fabergé Summer in Provence fine jewellery and watch collection is available worldwide from September with price on application. 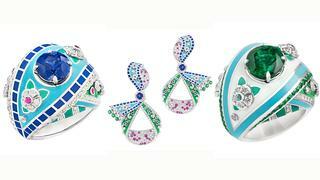 Visit faberge.com for more information.